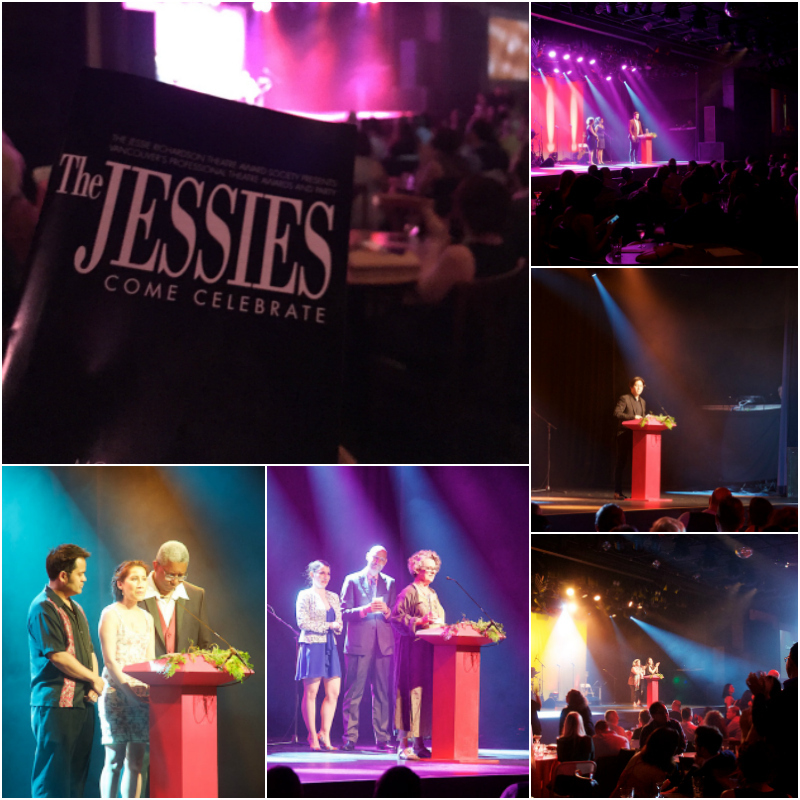 The 34th annual Jessie Richardson Theatre Awards (“Jessies”) were handed out in Vancouver last night, to a jubilant and artful crowd at the Commodore Ballroom. The past season of theatre, both large and small, for young audiences, and musicals, was celebrated and special awards were handed out to honour patrons, newcomers, and those who make a difference behind the scenes. For 2015-2016, over 40 companies registered over 70 productions, contributing to a dynamic theatre community. The show was produced by Holding Space Productions, and hosted by Omari Newton and Dawn Petten. It was opened by the Eagle Song Dancers with a welcome, and an Arts Umbrella performance followed before we got to the juried awards. The night moved very quickly, the Jessies are known to go long, and another year of theatre was toasted. Host Omari Newton joked about Hamilton collecting all of the awards at little did we know at the beginning of the show that The Arts Club’s Onegin would end up being the Hamilton of the night, picking up 10 awards. Donna Yamamoto: For outstanding leadership in developing work by 3 Asian-Canadian playwrights in the Cultch’s 2015-16 season as Vancouver Asian Canadian Theatre’s Artistic Director. Acceptance speeches were kept to a time limit, which helped the night move along swiftly, and many simply celebrated their teams, their peers, families, and the community. Donna Yamamoto spoke of developing and being diverse role models for the next generation, and that her award (new this year) brings hope of change and collaboration. Patron of the Arts Award winner Wendy Orvig shared an important message: “I always thought that being a patron of the arts was just about buying a ticket, but there’s so much more.” Dr. Margo Kane was also honoured for her work founding and growing Full Circle: First Nations Performance since 1992. Full Circle produces the Talking Stick Festival, which is the only multi-disciplinary first nations performing arts festival in North America. Too many highlights from #jessies16: @lim_milton's incredible speech, wins for my dear friends @lauramcln, @genevieve__f and @thezoocrew! Every year, so many excellent productions are recognized, by being nominated and through their awards, and every year I pledge to attend more shows in Vancouver. After last night’s ceremony, I wish I would have seen Onegin, or The North Plan, and Empire of the Son. I’m going to set the same pledge for myself again this year, and hopefully you’ll hold me to it. Large theatre, small theatre, musicals and festivals like rEvolver, Talking Stick, and Fringe. Shows at Firehall, The Cultch, Havana. We talk of education, quality entertainment, social issues, and the just plain funny. Get out and support the arts in your community next season! Follow the Jessies on Facebook and Twitter for more award information.